Seeking everyone everywhere past and present with the Édes surname. 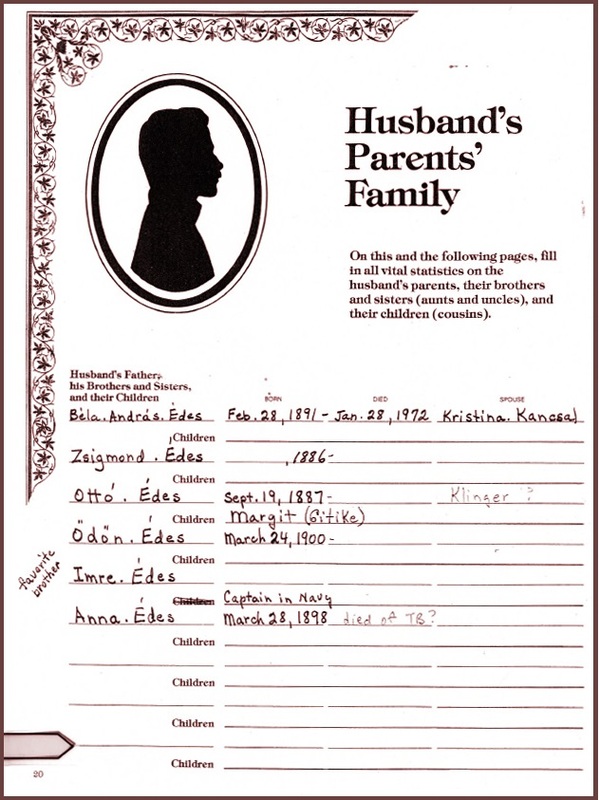 A FB Hungarian Genealogy friend pointed me in the direction of the Guild of One Name Studies. This amazing group of people are engaged in seeking all occurrences, past and present, of a single surname, anywhere in the world. My interest stems from a search for my father’s relatives. He was an only child but his dad had 5 brothers and a sister. Surely he has cousins somewhere. However here’s the page in Mom’s family tree book. It shows that only Uncle Ottó had a child, and a daughter at that. So far no luck finding cousin Margit neé Édes born I-don’t-know-when probably in somewhere-in-Hungary. So I thought I would give a try starting from the other direction. Our Édes family came from the Hungarian town of Mádar, now Modrany Slovakia. There are or have been hundreds of Édes folks from there, a couple of dozen of whom are now my friends. So I am on a mission to track down all the rest of them, eventually, and see if I can find any more family connections. It’s a bit of a long shot but I enjoy the hunt.